The secretive Koch Brothers — two billionaire oilmen who own Wichita, KS-based Koch Industries, the second largest privately owned company in the US — have been getting a lot of attention lately. And I’m willing to bet they’re not too happy about any of it. The latest revelation is that Koch interests process a quarter of the climate-destroying tar sands oil brought into the US. The Kochs are notorious for their greed-driven efforts to block all sorts of environmental and climate policies that would cut into their bottom line. Naturally, their self-serving agenda is meeting with increasing protest. For instance, the Kochs’ held a top-secret strategy session earlier this year — attended by conservative heavyweights like House Majority Leader Eric Cantor, former Attorney General Ed Meese, and Americans for Prosperity President Tim Phillips — that was met with a massive protest. And when it was revealed that Supreme Court Justices Antonin Scalia and Clarence Thomas attended a Koch event shortly before rendering the tragically misguided Citizens United judgment, which sparked outrage and a fiery debate on judicial ethics. Given their preference for secrecy, the Kochs can’t be thrilled that their extensive involvement in the tar sands has now become public knowledge. It turns out the Koch Brothers have a very good reason to spend millions of dollars to get Americans to question the validity of climate change. One of their businesses handles about 25% of tar sands imports into the US — they’re one of the biggest refiners of Alberta oil sands crude oil. Koch subsidiary, Flint Hills Resources, operates a Minnesota refinery that’s capable of processing 320,000 barrels of crude a day, about four-fifths of which is sourced from Alberta. They don’t want clean energy laws to impact those operations. Separating oil from tar sands requires huge amounts of water and energy (much more than conventional refining), resulting in much higher greenhouse gas emissions. Tar sand refineries would be early targets of greenhouse gas regulations, which is why they’re trying so hard to handcuff the EPA. While the Koch Brothers say regulations would kill jobs, what they would actually do is force them to invest in cleaner technologies. It’s important to keep exposing the Kochs. They use their considerable influence over our nation’s political process to protect their personal fortunes, plain and simple (each of the brothers is worth a reported $21.5 billion — not a typo folks, $21.5 BILLION — thanks to ever-increasing energy prices). 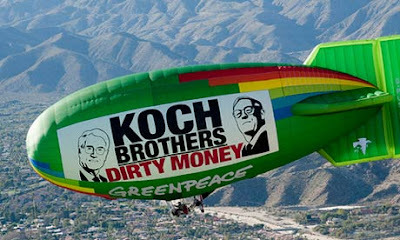 The Kochs don’t have anyone’s interests at heart but their own. Exposing them helps weaken their hold on the politicians who were elected to represent us. They’re feeling the heat: The Kochs have just registered to lobby the Alberta, Canada government. Perhaps they’re getting nervous that the pressure will cause decisionmakers in Alberta to rethink their commitment to producing oil from the tar sands. So the Kochs are doing the only thing they know how to do: Throw their money around, buy influence, try to force their skewed view of the world on the rest of us, and to hell with the consequences for the rest of the world.